During the early Christian period, artistic inspiration was drawn from two sources; Graeco-Roman and indigenous. Unfortunately, few Christian structures survived destruction during the Diocletian era. One can best see the persistence of Greek influence, however, in architectural features such as the niche and in artistic motifs such as the fish. 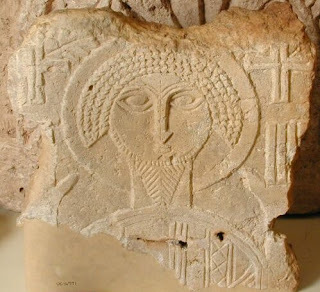 The question of the persistence of ancient symbolism in Christian art remains controversial. There is little doubt, however, that Gnostic literature and ancient tradition prompted artistic invention. It must be remembered that the bulk of the population could not read. Through the medium of familiar imagery new religious ideas were promoted. The archangel Michael weighing souls in the balance is akin to the ancient Egyptian god of wisdom, Thoth, weighing the heart of the deceased in the scales of justice (page 167). 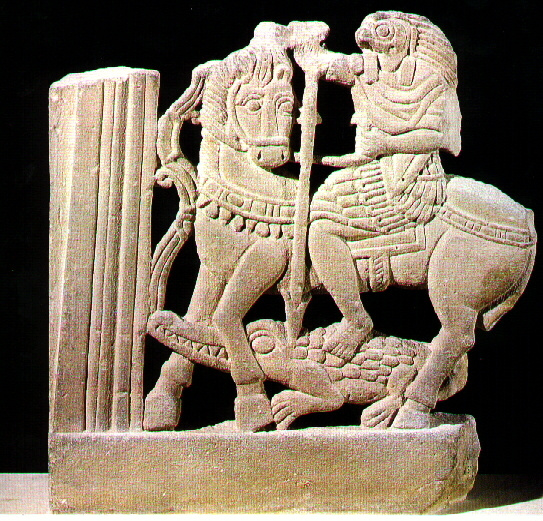 St George on horseback crushing evil beneath his horse’s hooves, recalls to mind Horus striking down Set, the incarnation of wickedness (page 14). It has not passed unnoticed by scholars that the Spirit or Holy Ghost in the early Church descended in the form of winged dove like the ancient Ba. Seigfried Morenz, the German scholar, suggests that the life of Joseph the Carpenter depicted on a fifth-century Coptic manuscript gives details of his death that closely resemble those of Osiris: Jesus sits at his head and Mary at his feet, much as Horus stood at the head of Osiris and Isis at his feet in the Egyptian myth. 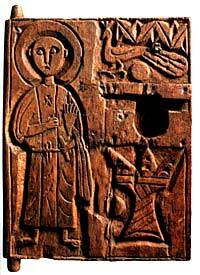 During the fourth and fifth centuries, the monastic way of life was spreading and churches were built in great number. There was a radical break with the past, especially as regards burial customs. Some of the bishops and patriarchs, on their demise, were clothed in the robes they had worn for religious services. These textiles, which had become known as Coptic tapestries, have been found in vast quantities in the graveyards in the Fayoum and in Upper Egypt, especially around Assiut and Akhmim. The earliest such fabrics were woven on a purple background, in the traditional technique inherited from the ancient Egyptians. The themes were nymphs, garlands, the cross, the fish and the hare, with geometric designs. At first all the weaving was on linen. Only later was wool used, by which time vine and grape themes had become popular. Animals were woven among branches, biting the fruit of the trees. Peacocks, parrots and ducks were popular themes, as well as some half-animal, half-bird creatures. These Coptic textiles developed into one of the finest of all the minor Coptic arts, showing a great sense of liveliness in the stylized figures. The costly art of mummification was falling into disuse. The bodies of ordinary people were wrapped in their clothing and interred as quickly as possible. Over the graves, however, tombstones were raised that were shaped like the ancient stelae. They bore the name, date of birth and death of the deceased, and many echoed the petitions and supplications inscribed in hieroglyphics on the tombs of the ancient Egyptians. The rounded top of many an early tombstone was decorated with the drooping wings of the protective vulture-goddess Nekhbet. From the end of the fifth century, Coptic tradition reached its full maturity. 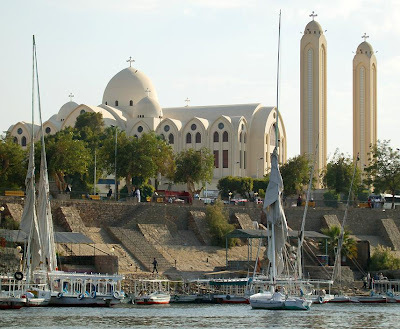 Some of the monasteries in Upper Egypt were to have widespread influence on Christian architecture; among these are the White Monastery and the Red Monastery near Sohag and the Monastery of St Simeon at Aswan. These pre-Islamic Christian structures in the Nile valley indicate many features of the indigenous tradition. Monasteries, which necessarily had to be at the site of a natural well or spring, were fortresses; the outer walls were usually massive and undecorated; some bear a striking resemblance, from a distance, to an Egyptian temple. Within the monastery were one or more churches. The earliest churches had simple ground plans in three main divisions: the atrium, the nave and the semi-circular apse. The atrium was a forecourt, surrounded by a colonnade (colonnaded cloister). To the rear was a porch, the narthex, preceded by stairs, much like the terrace to the rear of the open court of a temple. The porch gave access to the main body of the church through doorways (usually of wood), whose number was dictated by the number of aisles. The double-colonnaded nave, like that of a hypostyle hall, had side aisles, and usually terminated in another porch, or transept, which spread the width of the church. There was a formal separation of the main body of the church from the inner chambers, where only those in holy orders could pass. This separation was by means of a rail or screen, often inlaid. Beyond lay the semi-circular apse. 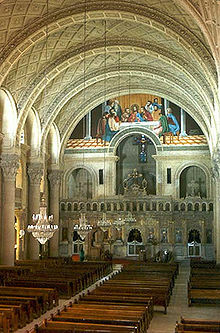 In the White Monastery (Sohag) and in the Monastery of St Simeon (Aswan), there are two additional semi-circular apses, one on each side of the central apse, facing each other. Thus did the traditional sanctuaries to the three gods of an ancient triad correspond, in a church, to three apses. The central apse held the altar to the saint; it had a canopy that was often supported on pillars. The two side apses were for use either on the saint’s feast day or for some religious celebration, it being a canon of Coptic law that neither the altar nor the vessels and vestments may be used twice on the same day. The earliest Christian churches were not designed by professional architects. A monk or a priest drew up the plan and ordered the decoration, drawing naturally from indigenous sources. At Abydos, for example, where the temple of Seti I is uniquely dedicated to seven deities (page 22), the church in the Monastery of St Moses (also known as the Monastery of St Dimiana) has seven rectangular sanctuaries (haikals), and above each of the seven doorways are icons of the respective patron saints to whom they are dedicated: St Anthony, the Holy Virgin, St Moses, St Michael, St Dimiana, St George and St John the Baptist. The soft sandstone used in Upper Egypt was particularly adaptable to architectural ornamentation. The sculptured friezes show sharp, deeply cut and distinct stone working, especially on the capitals of the columns, which became more and more stylized. Vines and acanthus were popular decorative motifs; the latter was slowly replaced by palm fronds or vine leaves, sometimes with the cross included in the leaf motif. The artists who had a taste for geometric forms, as is clear from their arabesques, were extremely adept at wood carving. 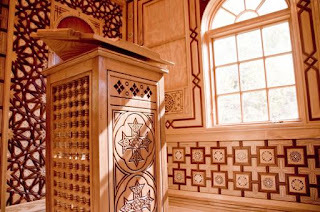 The altars, doors and screens are among the oldest and finest wood carvings of the Coptic era. A wealth of utilitarian objects were left at the monastic centres: bronze vases, bowls, candelabra, lamps, clay stands for clay pitchers and pottery of various kinds. In Upper Egypt the frog-shaped lamp was popular. Churches were decorated with ceramics and glassware (lamps and phials). Ostrich eggs, considered the symbol of the resurrection, were sometimes suspended in front of the screen. Above the screen separating the nave from the inner chambers was usually a row of icons. Mural decoration only started in the fourth century. These were painted on the stuccoed walls of a church and in the niches. The scenes were from the lives of the apostles and the saints, or the miracles they performed. Many an ancient temple was converted into a church; the reliefs of the ancient gods were plastered over, and Christian themes were painted. Sometimes an apse was built from inscribed stones that had fallen from ancient temples. Columns from Graeco-Roman structures were used for the nave and aisles. The Ankh or Key of Life was sometimes chiselled into the form of a cross. The artists painted in pure bold colours, never in half-tones. All the figures were shown in frontal position and always with serene smiling faces. There were no scenes of torture, of terror or of hell. Christ was painted enthroned and surrounded by angels, or shown blessing a figure beside Him - Christ the King and never the suffering servant. The Virgin Mother and Child were a frequently painted theme. Sometimes a row of venerated anchorites, monks and the founders of monsteries were depicted. In watching the mystery play of The Nativity, the Egyptians recognised in the Holy Virgin and Child their own beloved Isis and Horus; Isis, too, had guarded her son from those who wished them evil. The story of Jesus healing a blind man reminded them of Thoth, who spat on the wound in Horus’ eye (lost during one of his battles with Set), in order to heal it. The suffering and crucifixion of Christ and His resurrection, recalled to mind their own just and beloved ancestor, Osiris, who was slain and yet lived again. The rite of baptism or purification with water had its origins in the distant past, as well as the vapour of incense that was used to create a sympathetic atmosphere for drawing man and God together. The Egyptians readily embraced a religion that gave them familiar altars and priesthoods and ‘messengers’ from heaven. They knew well that ‘the sanctuary of God abhorreth noisy demonstrations’ and that they should ‘chant not God’s offices too loudly’, because the ancient wisdoms of the sage Kagemni had surviv ed in tradition. Perhaps it was easier for the Nile valley dwellers to understand the Trinity than many other early Christians, in view of their own triads (triple deities in one temple or threefold names representing different aspects of the same personality under which an ancient god was addressed). The doctrine of future rewards and punishments seemed no different to the day of judgement for both good and wicked in the Court of Osiris, when charity, honesty, justice and virture were the keys to a life everlasting. The Egyptians had long seen their dead as ‘the imperishable ones’ in heaven. And the concept of hell with thirst, fire, demons and spirits was startlingly familiar from ‘The sun’s journey in the Underworld’ (page 96). The Egyptians preferred to have an actual object of religious identification as a focal point of worship rather than abstract dogma. In many villages the people claimed that a relic, or relics, of a saint or martyr had been found. They started to build shrines to house them. This practice - which is reminiscent of the provinces (nomes) of ancient Egypt each claiming possession of a part of the body of Osiris and erecting shrines in his honour (page 19) had become so widespread that St Shenuda, Abbot of the White Monastery near Sohag, early in the fifth century, severely criticised the villagers in Upper Egypt. St Shenuda tried to purge Christian teachings and society from all traces of Graeco-Roman and Byzantine influence, destroy heretical literature and purge Christianity of ‘every kind of magic’; a phrase that appears frequently in the Nag Hammadi Library. In view of their age-old tradition one cannot help but wonder whether a celebrant priest in Upper Egypt intoned the liturgy ‘Amon...’ and not ‘Amen’ at the end of a prayer.